Untapped Shores International understands that your privacy is important to you and that you care about how your information is used and shared online. We respect and value the privacy of everyone who visits Our Site and will only collect and use information in ways that are useful to you and in a manner consistent with your rights and Our obligations under the law. Our Site, untappedshores.org, is owned and operated by Untapped Shores International, a 501(c)(3) non-profit organization whose mailing address is at 204 Seneca Road, Rochester, NY 14622 USA. With your permission and/or where permitted by law, We may also use your data for marketing purposes which may include contacting you by email, telephone, social media, AND/OR snail mail with information, news and offers on Our products AND/OR services. We will not, however, send you any unsolicited spam and will take all reasonable steps to ensure that We fully protect your rights and comply with Our obligations under the GDPR and the Privacy and Electronic Communications (EC Directive) Regulations 2003, as amended in 2004, 2011 and 2015. We only keep your data for as long as We need to in order to use it as described above in section 5, and/or for as long as We have your permission to keep it. In any event, We will conduct a bi-annual review to ascertain whether we need to keep your data. Your data will be deleted if we no longer need it in accordance with the terms of our Data Retention Policy. We may share your data with other companies or parties in Our group. This includes our partners or subsidiaries AND/OR authorized contractors. We may contract with third parties to supply products and services to you on Our behalf. These may include payment processing, delivery of goods, search engine facilities, advertising, emailing, and marketing. In some cases, the third parties may require access to some or all of your data. Where any of your data is required for such a purpose, We will take all reasonable steps to ensure that your data will be handled safely, securely, and in accordance with your rights, Our obligations, and the obligations of the third party under the law. We currently contract with companies such Adept, Stripe, Paypal, WordPress, GiveWP, DonorBox, Clickfunnels, Hubspot, Trello, Asana, Slack, Mailchimp, Actionetics, Active Campaign, Google for Business, and others that are essential to effectively running a non-profit organization. You may also wish to sign up to one or more of the preference services operating in the USA The Telephone Preference Service (“the TPS”), the Corporate Telephone Preference Service (“the CTPS”), and the Mailing Preference Service (“the MPS”). These may help to prevent you receiving unsolicited marketing. Please note, however, that these services will not prevent you from receiving marketing communications that you have consented to receive. By using Our Site you may also receive certain third party Cookies on your computer or device. Third-party Cookies are those placed by websites, services, and/or parties other than Us. We use third-party Cookies on Our Site for advertising services, analytics, and market research. For more details, please refer to section 5, above, and to section 12.6 below. These Cookies are not integral to the functioning of Our Site. Before Cookies are placed on your computer or device [, subject to section 12.5] AND/OR [section 12.8], you will be shown a [Insert description of prompt e.g. pop-up, message bar etc.] requesting your consent to set those Cookies. By giving your consent to the placing of Cookies you are enabling Us to provide the best possible experience and service to you. You may, if you wish, deny consent to the placing of Cookies; however certain features of Our Site may not function fully or as intended. Certain features of Our Site depend on Cookies to function. USA and EU Cookie Law deems these Cookies to be “strictly necessary”. These Cookies are shown below in section 12.6. Your consent will not be sought to place these Cookies. 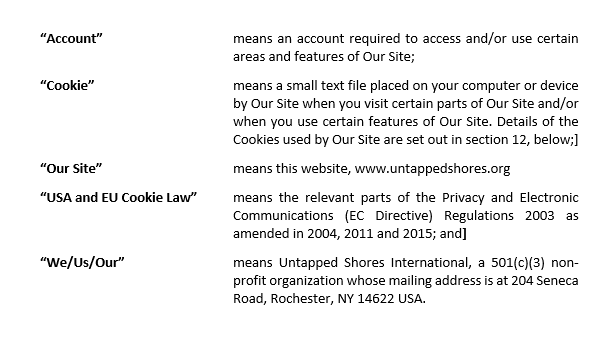 You may still block these Cookies by changing your internet browser’s settings as detailed below in section 12.10, but please be aware that Our Site may not work as intended if you do so. We have taken great care to ensure that your privacy is not at risk by allowing them. Our Site uses analytics services provided by various analytics programs. Website analytics refers to a set of tools used to collect and analyse usage statistics, enabling us to better understand how people use Our Site. This, in turn, enables Us to improve Our Site and the products and services offered through it. You do not have to allow Us to use these Cookies, as detailed below, however, whilst Our use of them does not pose any risk to your privacy or your safe use of Our Site, it does enable Us to continually improve Our Site, making it a better and more useful experience for you. 13.2 How does our site handle Do Not Track signals?